Written by an author whose expertise grew from an extensive counseling practice as well as personal experience. 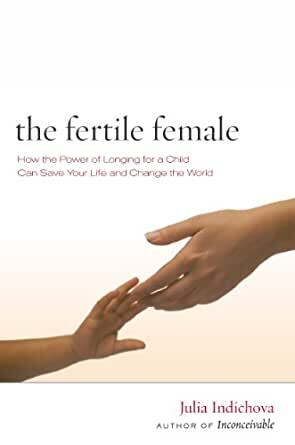 The Fertile Female offers a hope-filled view of reproductive difficulties, with a deeper understanding of the often-confusing messages of mind-body and alternative medicine. With an engaging mix of passion and humor the book initiates a public debate on the politics of infertility and its effect on our health care system. Includes practice exercises and a section on dietary recommendations, complete with recipes. Julia Indichova's work and story have been featured on the Oprah Winfrey Show, Good Morning America, Oxygen, and in Health Magazine and the San Francisco Chronicle. She is the author of Inconceivable. I firmly believe that reading this book, and then doing the work, allowed me to conceive our baby (now almost 1!). It took 4.5 years for me to get pregnant, including 6 IUI and 2 IVF cycles (none of which worked). We had an unexplained infertility diagnosis, with possible male factor. After our second IVF cycle, I ordered this book and Inconceivable in May. I read both books, and then decided to join the 3 call teleconference in July. In September I was pregnant! I had already been eating healthy, exercising, practicing fertility yoga, taking some supplements etc but started doing the visualizations each morning and evening from June on (you do have to purchase and download the visualizations if you want to be able to listen to them instead of just read them, but the cost for those compared to what we had already spent on IUIs and IVF was nothing). Initially it was hard to pick which visualizations to do, but we did get guidance during the teleconference. The book is great, and an inspiring read. Personally I think that downloading and doing the visualizations and participating in the teleconference helped me more, but this is a great place to start. It's been 2 years since I ordered the book, and I don't post a ton of reviews, but I just thought this might help someone to make the decision to purchase the book and do the work. Good luck on your journey, whatever you decide! For anyone who is logic-based or science-based in their approach to life or specifically medical diagnoses, Julia Indichova's philosophy and approach can seem implausible and unnerving. Human nature wires most of us to react to differences with a closed mind and negative attitude; this is a time where you will help yourself by rising above that human instinct of yours to reject that which is different than what you have been exposed to previously. Because my doctors had no actual explanations for my infertility other than unproven theories - nothing empirical other than blood tests that vary each month - I remained open-minded and decided to learn from those who had suffered before me. Julia Indichova's struggle, unfortunately, is not that unique. What is unique about her struggle is how she decided to ignore her doctors' negative assessments that she would never birth a second child, and to figure out, on her own, how to better improve her reproductive system. This book is especially relevant for those with a diagnosis of "unexplained infertility" or the euphemism diagnoses (since doctors do not like to admit they do not know the reason, so they pretend the quantity of your eggs has something to do with their quality) of "low ovarian reserve," "advanced maternal age," and "low AMH." Julia's first book, "Inconceivable" led me to her workshop and her second book, The Fertile Female, which I read in preparation for the workshop. It takes not only an open-minded person to accept the possibility that her doctors do not know the true causes of her infertility / inability to carry to term / conceive as well as a brave person to be willing to explore what if any psychological blocks / negative thoughts could be infiltrating her body in a way that harms her reproductive function. As a logic and science-based person, my policy would be to wait until a study is released proving the cause-effect between negative thinking / self-defeating thoughts and infertility; or I could be open-minded and take a chance and try something that has not only worked for Julia Indichova, but for many others who have followed in her footsteps. You will willy-nilly spend $20,000 for another IVF round yet balk at the minimal economic cost to buy her book or CDs or workshop session? Is that logic-based? No. When your doctors aren't able to diagnose or "fix" your problem, and their only solution corresponds to the definition of madness (i.e., "keep doing the same thing but expect different results! "), you have a choice: (1) give up your dream and accept that you will never be a parent; (2) trust that your doctors somehow know what they evidently don't know and continue to pay them $20,000 every 2 months; or (3) try something different that cannot harm or delay you or your plans - stop pretending for a moment that your mind is not connected to your body - that your mind is not affected by your body or by the negative thoughts you have, and data you have received regarding your condition for so many months/years. Choice #3 became obvious to me after some time. I found her book helpful in that it made me re-examine my doctors' conduct and prognoses, and re-inspired me to view the glass has half-full. Her workshop is like a fivefold dose of her book, and I will admit I attended the workshop with some doubts as to how can someone who has no medical doctorate diagnose and fix me? And the answer is, by giving you the tools to empower yourself to "fix" yourself in ways not even you can truly understand. The overarching philosophy is that your body affects your mind, and your mind affects your body in ways psychiatrists have yet to fully map and understand. So you can wait until you're 80 years old and childless until a definitive study is published linking desperate thoughts about your AMH level with infertility or you can give Julia and all her followers the benefit of the doubt and help yourself in the process. From my personal experience of fear and doubt, anger and despair, after many cycles and several miscarriages, a diagnosis of "unexplained infertility" and doctors who said to continue doing the same thing yet expect different results, I am happy to share that a few weeks after attending Julia's workshop and regulating everything in the next cycle and ignoring my doctor's self-serving advice (skip this cycle so you can do IVF next cycle and pay me another $20,000 because somehow this time it will work), I conceived my child in a natural cycle, a child whom I expect to carry to term. I can't state with certainty that reading Julia's books or attending her workshop is 100% responsible for my wonderful news; but attending the workshop was the major difference between the cycle I conceived versus all the prior unsuccessful ones. This is strong circumstantial evidence, and even if it is only 25% responsible for my desired outcome, that 25% matters to me! You can't get to your 100% result if a critical 25% is missing. You have virtually nothing to lose by reading her books and opening your mind, yet you have so much to gain by doing so. Best of luck on your journey to parenthood. 5.0 out of 5 starsSoothing to my soul still, four years later. I have read and re-read this book so many times now I've lost count. Julia's words are soothing to my soul. This book continues to be medicine for my body four years later. This book is an absolute must read for anyone struggling with fertility or any other life challenging situation. This book gave me hope and taught me how to become a better me. At the time I found this book I had been diagnosed with POF with an FSH of 28. I had gone through IUIs, IVF and IVF with donor eggs. Nothing had worked. I was full of despair, panic, fear, anger and desperation. I now have a beautiful son, conceived naturally and even more I know myself better and healed decades of sadness I didn't even know were a part of me. I am forever grateful to Julia and that I read this book. It literally changed the course of my life and continues to be my lifeline on a difficult day. I recommend this book to anyone struggling with any aspect of their life. It truly is a must read. I believe this book made magic. It got me into the right mindset to finally conceive. We had been trying for three years, with one missed miscarriage at 13 weeks and two early miscarriages. I was completely consumed by the project, tweaking my diet and planning my life around ovulation dates and testing. Somehow this book made me feel at peace and ok with whatever was to come. I felt ok, and it felt good. I bought this book at the end of February 2010 and read it in the following weeks. By the end of April I was pregnant. He is now a first grader and his sister, conceived literally on the first try, in preschool. I got everything I hoped for and more. So powerful! I read Julia's other book Inconceivable and it resonated so much with me and I picked this one. The Fertile Female helps you to empower you in the fertility journey. Like many other women (and men), I experienced the heartbreak of infertility, IVFs, miscarriages. This book gives you hope, help you to take back your own voice, and see what might hold you back. And this journey can become a great healing force in your life regardless of the outcomes. I would highly recommend to check out her website and her workshops for additional resources.